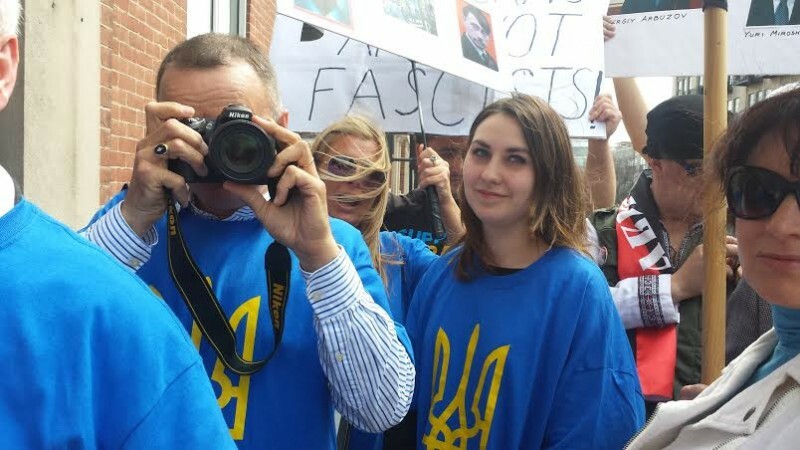 Chicago forum on U.S. role in Ukraine: fascists attempt disruption | Fight Back! Chicago, IL - Under attack from aggressive Ukrainian fascists, 40 anti-war activists held a teach-in here on the unfolding Ukraine crisis and NATO expansion, April 12. An equal sized crowd of Ukrainian reactionaries, one carrying the battle flag of the fascist Ukrainian Insurgent Army and another man wearing a scarf bearing the insignia of the violent neo-Nazi Right Sector, attempted to push their way into the door of the union hall during the speakers’ presentations. When they failed to get inside, one of them slipped a Right Sector leaflet through the door. It included language used in Hitler’s Mein Kampf, such as the need for “living space” for Ukrainians. The flyer defines Ukrainians as a “genetic community,” meaning that the Russians and Jews that live there aren’t part of their nation. Delivering his remarks over the muffled chanting from outside, Rick Rozoff from the Stop NATO Network detailed the U.S.’s imperialist maneuvers in Ukraine, emphasizing the role of NATO as a vehicle for American foreign policy. Rozoff explained the State Department intervention in Ukraine and arms build up in Eastern Europe as part of a long-term strategy to besiege Russia. Speakers from the Anti-War Committee-Chicago included Kait McIntyre, who is running as an anti-war candidate for Boeing’s Board of Directors. McIntyre’s campaign targets the world’s second largest weapons manufacturer, headquartered here in Chicago, which profits off the billions poured into drone warfare and NATO expansion by the U.S. defense budget. Sara Flounders of the International Action Center in New York outlined the historical cooperation between the U.S. and fascist forces in Europe. The U.S. propelled these forces into power during the violent breakup of Yugoslavia, aided by the NATO bombardment. She stated that the U.S. actively maintains right-wing opposition movements around the world in order to eliminate governments that assert their national independence. With the fascist Svoboda party now occupying prominent positions in the new Ukrainian regime, the anti-war movement must take a strong stand against U.S.-funding of the Kiev junta, whose rise to power, as Rozoff noted, echoed Mussolini’s March on Rome. Alfonso Casal of the American Party of Labor (APL) told attendees about the history of fascism in the Ukraine. The panel was organized by Freedom Road Socialist Organization, Workers World Party (WWP) and APL, with Erich Struch of WWP as chair of the event. Many young people attended and contributed to the engaging discussion. The participants bravely defied right-wing intimidation to stage this important teach-in, refusing to allow the fascists to shut down the meeting.